Australians hold an immense amount of respect for doctors. In fact, a survey conducted by Reader’s Digest revealed that being a doctor is perceived to be the sixth most trusted job in the country. This is hardly surprising though— after all, how many people can say that they save lives on a daily basis? “A doctor who was seriously injured when he was run down while cycling through Cottesloe late last year is leading the push to make Perth’s streets safer for cyclists. 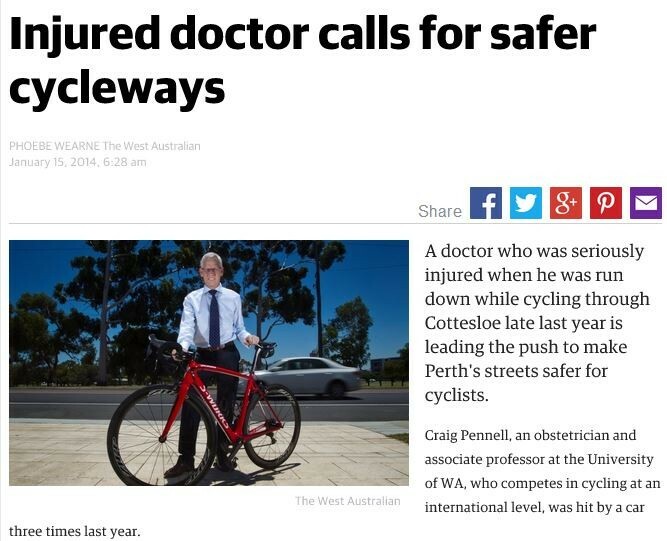 Craig Pennell, an obstetrician and associate professor at the University of WA, who competes in cycling at an international level, was hit by a car three times last year. Only his bike was damaged in the first two incidents, but he had 18 rib fractures, a shattered shoulder and a collapsed lung in a crash on Marine Parade in October. As you can see, careless motorists do not distinguish amongst their victims— everyone, regardless of profession, is at risk of being hit by a car. As a result, Dr. Pennell has launched a project called Cyclesafe WA, which seeks to educate both drivers and cyclists about their rights on the road. While increased awareness will surely help prevent such accidents, doctors must also be proactive when it comes to protecting themselves against illnesses and injuries. Dr. Pennell was lucky to fully recover in three months, but others might be out of commission for much, much longer than this. Just like others, if they can’t work, they can’t pay their bills, mortgage, student loans, and other financial obligations. Fortunately, certain financial companies offer income protection for doctors as a safety net for when unfortunate circumstances happen. In essence, income protection is a type of insurance which pays out a benefit while you are unable to work. Different policies exist, but many will reimburse up to 75% of your pre-illness income till the age of 65, allowing you and your family to live comfortably as you recover from your ailment. Of course, you need to carefully choose which company to work with. Thankfully, trusted companies like MEDIQ Financial Services provide a comprehensive array of financial services, like income protection policies, loans or financing, and even lawful tax deductions for doctors. With their help, you can perform your duties as a medical professional without fear of the future.